I am redoing my inspiration board and thinking back to how happy this one is from stylist Sabrina Linn's space as seen over at Canadian House and Home via Jordan. this whole setup is just lovely! 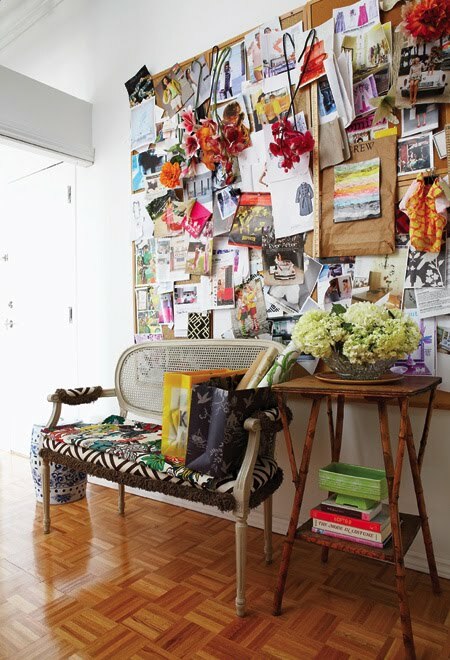 can't wait to see your new inspiration board! beautiful! I'm thinking whether I make me also an inspiring board! this is gorgeous! love the use of color, there has been so much gray and black lately...this feels like there is still hope for summer! lovin it! now that would get me going in the morning! haha. i'd love to see your inspiration board! I see a weekend project from this. Couldn't survive without one. It feeds the vision of who you are in your mind. Or who you'd like to be. Megan, how about the front of your refrigerator? Hang it with cute magnets.